When it comes to natural nails, Jessica Cosmetics is considered a world leading brand, with a range of nail products to help you achieve and maintain naturally beautiful nails. Having tried many top brands on the market over the last 20 years, Julia knows how good Jessica Nail products are and uses them in the salon for manicures, pedicures and Gel Nails – simply because she’s sure it’s the best product range out there. Jessica Phenom is a brand new way to enjoy a longer lasting manicure with a fast-drying formula that provides a gel-like shine. 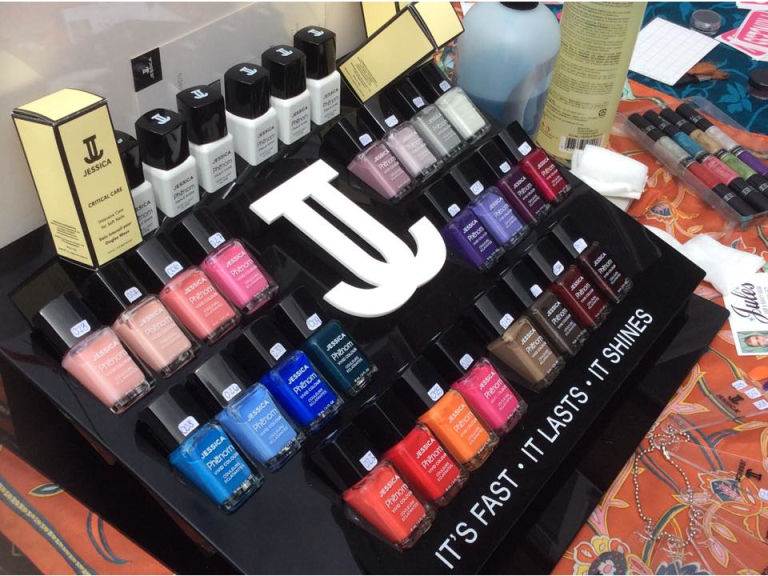 With Jessica Phenom nail polish the team at Jules can quickly create a super glossy manicure or pedicure and there are lots of gorgeous colours to choose from. Each manicure and pedicure is tailored to your needs; removal of old polish and hard skin, cuticles trimmed, nails reshaped, cuticle oil, hand lotion…. Want to treat your feet? A Zenspa luxury pedicure will leave your feet feeling soft and beautiful. Jules uses Intense Hydrating Heel Repair Cream and the Revive Microdermabrasion Foot Scrub to give you smooth and pampered feet. Relaxing, Revitalising and Rejuvenating…finished off with a gorgeous Jessica nail colour. Want a lasting finish? Jessica GELeration is a soak-off gel nail system created with the nurture of your natural nail in mind. It protects your nails, while offering weak, bitten or problem nails the opportunity to grow underneath the gel. Did you know that GELeration can last 3-4 weeks? It’s is durable, flexible, non-chip, non smudging and has a long lasting high gloss shine. Give Jessica a try at Jules by calling 01229 870657 and see for yourself why they love it so much – and don’t forget to mention you found them on thebestof!